here are many varieties of Indonesian poultry dishes. 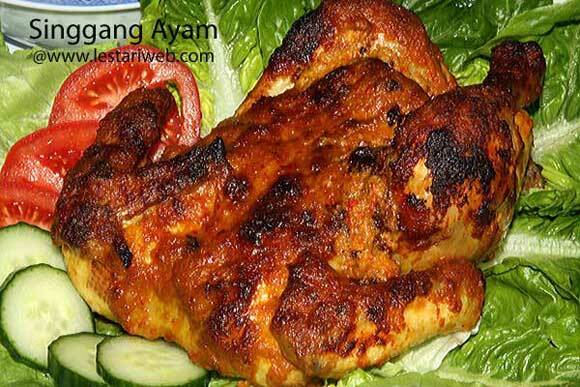 A famous variant among them is "Singgang Ayam" or "Grilled Chicken ala Padang" which's originated in Padang, the capital city of West Sumatra Province. This is one of my favorite recipes - A special New Year's Eve Dinner menu for the whole family & close friends. Tips: If possible, choose the young chicken for the better taste. There are two ways of cutting method, concerning the serving's appearance. If you want to have a whole chicken to be served, then cut chicken in half lengthwise along backbone, leave the breast uncut. Tie up the chicken together with kitchen string. This way you will get a lovely roasted chicken at the end (see picture). If appearance is not your concern, then just cut the chicken in half lengthway on both sides. The advantage of this method : The chicken is much easier to be handled & no need extra attention. Whatever methods should you prefer, the taste should not be different. Good luck !! 1 Put all ingredients for the paste in a blender or food processor and blend until smooth. (If necessery add a little bit oil to help the blending process). 2 Heat 2 tbsp oil in a wok or largish saucepan. (Don't add oil if already added in a blender). 3 Stir fry the paste, lemon grass, kaffir-lime leaf and bay leaf in a large skillet/shallow pan. Stirring all the time until fragrant. 4 Pour in the coconut milk and bring to boil over a medium heat. Stirring constantly. 5 Add the chicken, cook the breast side over medium-high heat for 20 minutes. 6 Turn the chicken around, then cook the other side for another 20 minutes. Take the chicken out and set aside. 7 Simmer the sauce over a low heat until the coconut milk is little bit driven off and the sauce becomes thicker. 8 Adjust the seasoning, add salt if necessary. Remove from heat. 9 Meanwhile prepare the charcoal for Grilled Chicken, otherwise preheat oven to 350°F (180°C) for roasted one. 10 Pour the sauce evenly on the chicken, so that all surfaces are well coated with the sauce. 11 Grill the chicken for barbecue. Or roast in a pre-heated oven for about 20 minutes. 12 Serve hot with rice, salad and Green Chilli Sambal (if you like it spicy!! ).